Have you ever eaten prickly pear (genus opuntia) cactus fruit? I never knew cactus plants produced edible fruit until we moved to Ecuador. The only cactus plants I had ever seen in Canada were in little pots, growing indoors. When researching this post I found out that some prickly pear cactus do grow in Canada, but not in the area we are from. Tuna is what the fruit from the prickly pear cactus is called here in Ecuador. We had been wanting to try some prickly pear, or tuna fruit for quite some time, so we picked some up the other day and decided to share it with you here on the blog. We didn’t pick it off of a cactus plant, we bought it at Super Maxi in Cuenca. When I picked it up, I took for granted that all the thorns would have been removed, I was wrong! After I had a few in the bag I noticed that my fingers were full of tiny hair like thorns. Those little thorns are very fine and hard to remove! I wasn’t quite sure how to eat prickly pear cactus fruit without getting full of thorns again, so I did some investigating. A great suggestion is to pick the fruit off the cactus with kitchen tongs, steady it with a fork, cut along each side and than peel the skin off with the fork. You probably won’t be carrying kitchen tongs around the grocery store with you, but putting a couple of produce bags over your hand like a glove would probably do the trick. The thorns might not look like much, but they are a real pain! The fruit inside looked kind of like papaya, but the seeds were mixed all throughout the fruit. I tasted a little, it was mildly sweet and tasted a bit like watermelon. I couldn’t eat it because of the seeds so I made some juice. So the question is probably not how to eat prickly pear cactus fruit, but how to drink it. I used a strainer and kept mashing and stirring the fruit, so the juice and pulp would come through. I added a little water to wash all the fruit off the seeds. It only took about a 1/4 cup of water to make a nice glass of juice. The juice was good and tasted a little like papaya juice. I added a little honey, but you can drink it without any sweetener. Like most fruit, the tuna/prickly pear is good for you. It’s a powerful antioxidant and a good source of magnesium, dietary fiber and vitamin C.
For more interesting South American ingredients and recipes check out The South American Table. This book has 450 recipes and interesting facts on the history of South American cooking/ingredients. Learn about dragon fruit – another delicious cactus fruit. Have you tried prickly pear fruit? Did you like it? Do you have any tips about how to eat prickly pear cactus fruit? Please share by commenting on this post. My son and I were in Ecuador,from 15/01/01 for 90 days, I did not eat any fruit we have in Canada. Even the variety of bananas was a surprise. I am old,my son is divorced,but met a lovely mujer in Gyayaquill. Love my wife Betty’s answer when I asked how she used to remove the thorns from the prickly pears when growing up in West Texas as a young girl – ” I had my boyfriend do it!” Smart girl – now you know why I married her! Beautiful photos – makes me want to try one right now! You should write and illustrate a cook book (be sure to let me know when it is available!). I keep it simple, I cut the puppy in half and eat with a spoon. If you don’t like thorns you can hold it in a rag or such. 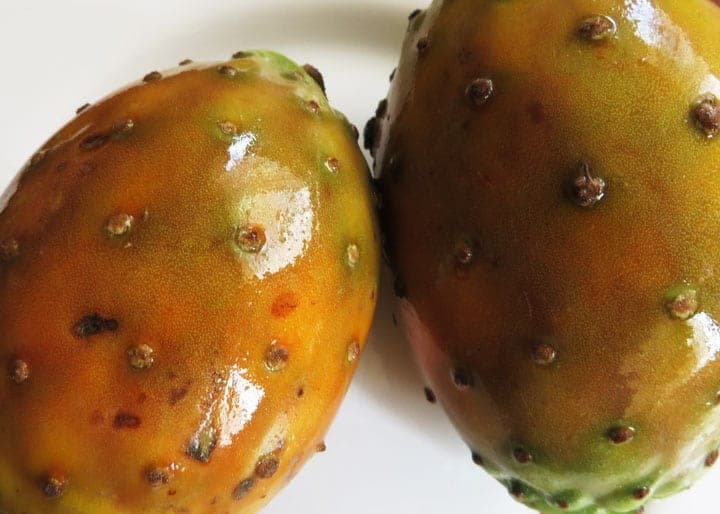 We love tunas (prickly pears) and pitayas (another cactus fruit)! We used to buy Prickly Pears by the bucketful when we lived in Andalucia. The vendor would always have the thorns removed, That way, one could slice down the middle and eat the insides with a spoon. As I remember, they were equivalent of one cent each. Duct tape or simply la cinta is the best way to remove the thorns.